weekend starring Venkatesh, Ritika Singh in key roles. Sudha Kongara Prasad has directed this film and produced by S. Shashikanth under Y Not Studios with Santhosh Narayanan musical scores. Read below for Venkatesh's Guru Movie Review. Aditya (Venkatesh) an aggressive boxing coach who clashes with sports federation will be transferred to Vizag to scout young women boxers. Aditya who comes across local slum girl called Ramudu (Ritika Singh) will decide to chose her as his boxing candidate and begins training her. Ramudu who is against Aditya's training will trouble him with her attitude. Rest of the story deals with How Aditya trains Ramudu and makes her an Indian Woman Champion Boxer. 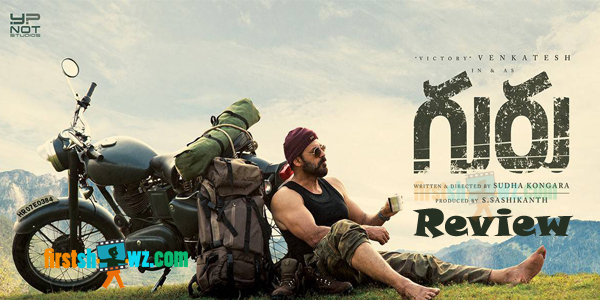 Victory Venkatesh has tried unique role in representing as an aggressive coach and his role will be outstanding throughout the film with well carried emotions. Ritika Singh performs her role with an ease and looks apt as local slum girl. Nasser and Zakir Hussain are good in their supporting roles. Guru has the best elements and technical sounds good in all elements. Music by Santosh Narayana is decent and the background score by the Music Director is at top notch. Production Values by Y Not Studios is rich. Cinematography is neat and Editing scores big. The Director, Sudha Kongara plays the game safe with not wasting any time of the audience with her intelligent screenplay. The way she narrated to story and the balanced emotional content should be praised. Guru is the film about an aggressive coach and her young women boxer who will be trained to represent Indian Woman Boxing Championship. This time Venkatesh will be sure shot winner in collections in overseas for this aggressive dramaline and the major plus is Ritika Singh. Apart from few scenes, the film makes a decent score at the Box Office and will impress audience with racy boxing kicks.